The Kremlin – synonymous with Moscow, the residence of the Russian President and an ancient citadel with enough history to occupy even the most discerning of travellers for a number of days. Home to Russia’s rulers for generations and declared a world heritage site by UNESCO, two thirds of the Moscow Kremlin’s twenty-seven hectares of triangular grounds are actually closed to the public but the remaining third is chock-a-block with some of Russia’s most treasured attractions including palaces, cathedrals, museums, squares, bell towers and a few curious and odd artefacts. Originally the citadel was first surrounded by wooden walls erected in 1156. The brick walls seen today are over two kilometres long, between 3.5 and 6.5 metres thick, and their height varies from five to nineteen metres according to the terrain. They were built towards the end of the 15th and the beginning of the 16th centuries under the supervision of Italian architects. Aristotle Fioravanti ensured that the Kremlin's walls and towers integrated well together, and his follower Anton Friazin built the Tainitskaya Tower incorporating a secret passage to the Moscow River and a well which was dug under the tower for access to water when under siege. Later, nineteen other towers were built including the Spasskaya Tower which is the tallest at a height of 71 meters. As it is the only tower facing the Red Square, it is considered as the main tower with an entrance to the Kremlin. The famous "Kuranty" clock, which ushers in every New Year on all Russian television stations, forms part of this tower. Within the Moscow Kremlin walls, structures from the 15th to the 20th centuries combine to create a unique collection of architecture in five squares and three streets. Right at the very centre of the Kremlin is the main square - Sobornaya Square or Cathedral Square as it is better known. The Cathedral of the Annunciation (personal church of Moscow’s Tsars), the Cathedral of the Assumption (the oldest, largest and most important) and the Cathedral of the Archangel Michael, as well as the Church of the Twelve Apostles and The Church of the Deposition of the Robe all stand around it. 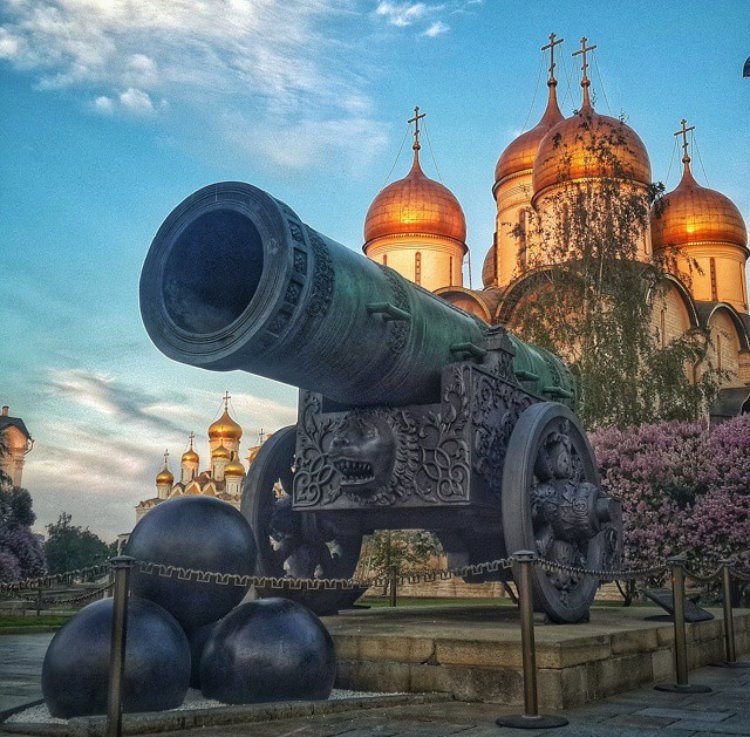 For centuries to this present day, the Golden Domes of these famous Kremlin churches stand out and are a picture and postcard favourite for visitors to Moscow. On the Red Steps of the Faceted Chamber leading to the square, rulers of Russia through history used to emerge to address their people and ambassadors from foreign lands were also typically welcomed here after passing through the main gates into the citadel. Official parades marking coronations of Tsars as well as religious processions on church feasts were all held here in the main square of the Moscow Kremlin. The oldest building in the Kremlin is the Palace of Facets which was commissioned by Ivan III in 1485, followed by the Terem Palace, the first home of the royal family. These two palaces link to the Grand Kremlin Palace built in 1838 by Nicolas I at a cost of eleven million rubles - an incredible sum in those days. Over a billion dollars were spent on its renovation in the 1990s. It consists of five dazzling reception halls, a ceremonial red staircase, and imperial private chambers. Another landmark is the Ivan the Great Bell Tower. This 81 metre structure was built to mark the exact centre of Moscow in 1600 and up to the October Revolution was the tallest construction in Moscow, as it was forbidden to build anything higher. Its 21 bells used to be rung on church holidays as a cue for all other bell churches in Moscow as well as in war when the enemy was approaching. The Tsar Bell, the largest bell in the world, is today on display on the ground with its intricate relief work. The construction of this 202 ton beast was full of misfortune and the bell never got to fulfil its original purpose. The last of which is the evident 11 ton cracked chunk that lies as a separate piece from the whole due to overheating and uneven cooling in its production. Another epic artefact with a curious story is the Tsar Cannon. At more than five metres long and weighing more than 39 tons, this is one of the largest and oldest cannons in the world. However, similarly to the Tsar Bell, it was also destined to never accomplish its objective. The cannon balls surrounding it at a thousand kilos each are purely decorative. Finally, two of every visitor’s favourite museums - the Kremlin Armoury and the Diamond Fund. Here treasures of generations of Russian Tsars and Patriarchs are exhibited in arguably Moscow’s most rich attraction. The wide collection of arts, armour, icons and silverware, thrones and regalia from 5th to the 20th centuries are unmatched anywhere. The world famous Faberge Easter Eggs, Monomakh Cap, Imperial Crown of Russia, and the 190 carat Orloff (or Orlov) Diamond are some of the few items in this magnificent collection.